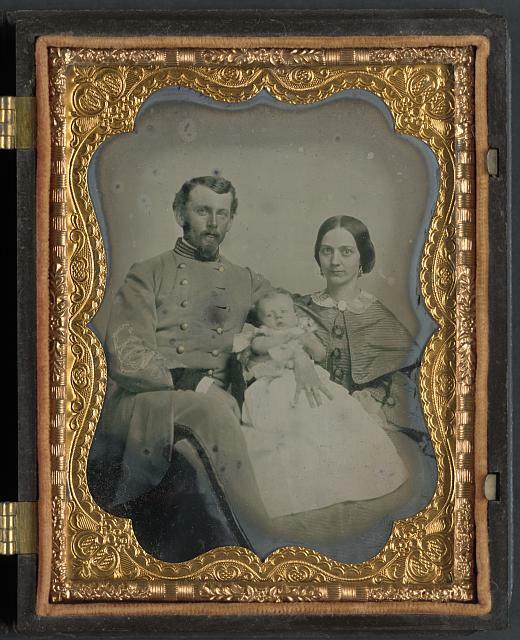 Unidentified officer in Confederate uniform with wife and baby, between 1861 and 1865. 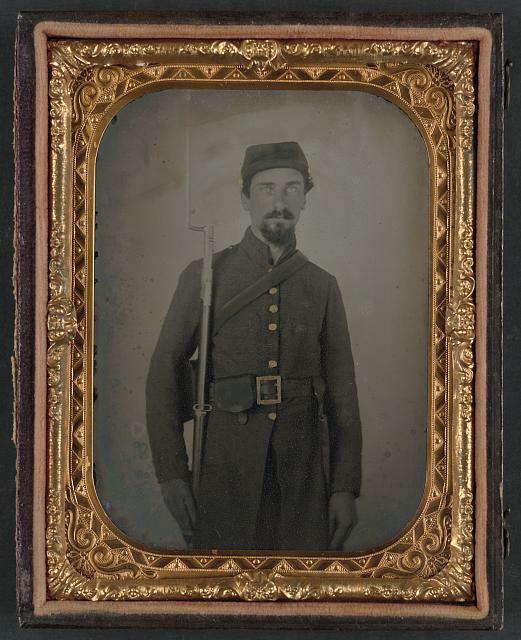 From the Library of Congress Liljenquist Family Collection of Civil War Photographs, AMB/TIN no. 2819 [P&P]. This partnership between the Georgia Historical Society and Georgia Public Broadcasting provides short articles, videos, teaching tools, and other resources about Civil War topics on specific days. Browse through articles by time period or search for specific articles. Provides encyclopedic entries about a variety of Georgia topics, including the Civil War in Georgia. The entries on this page are broken down by Civil War Events, Groups and Organizations, Figures, Places, and Topics. Learn more about the Civil War through documents, photographs, artifacts, and other items from the Georgia Historical Society Collections. This online exhibit focuses specifically on the many different flags used by the Confederacy in Georgia during the Civil War. 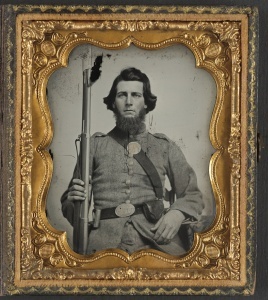 Unidentified soldier in Confederate uniform and Georgia state seal belt buckle with musket. 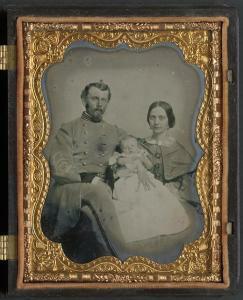 From the Library of Congress Liljenquist Family of Civil War Photographs, AMB/TIN no. 2991 [P&P]. Manning demonstrates convincingly that soldiers fighting for both the Confederacy and the United States understood the centrality of slavery as the cause of the war and the cause for which they individually fought. A new biography of Lee that examines him through the lens of his private letters, many published for the first time. The result is a refreshing approach to Lee’s life as a soldier, his devotion to his wife and his native state, and his fateful—but far from inevitable–decision to break his oath and leave the United States army in 1861 and the consequences of that decision for himself and his family and his place in history. Jones places race at the core of the conflict in Georgia’s oldest city, deepening our understanding of the Lowcountry as the center of “Africa in America,” and the ways in which the effects of the War continue to shape—and haunt—Savannah in the 21st century. The dean of Civil War memory studies meticulously and convincingly demonstrates how the moral meaning of the nation’s greatest conflict was eventually sacrificed on the altar of racial solidarity and sectional reconciliation, and how the emancipationist and Union interpretations of the war crumbled under the combined weight of turn-of-the-century American imperialism and racism and the rise of the Lost Cause. Gallagher focuses on how different films and forms of art have shaped our collective understanding of the Civil War in memory, and how the Lost Cause interpretation continues to resonate in American society in large part due to the ways in which popular culture embraces its romantic aspects, despite having been long ago rejected and overturned by scholars. 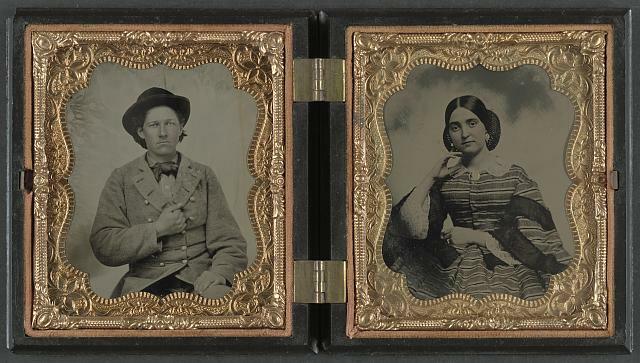 Unidentified soldier in Confederate uniform and unidentified woman. 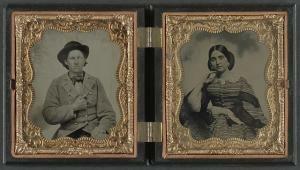 From the Library of Congress Liljenquist Family Collection of Civil War Photographs, AMB/TIN no. 2926 [P&P]. In these two short essays Ayers reflects on the War’s continued meaning in American society and the ongoing debate over the cause of the Conflict. Williams’ study focuses on the half-million Southerners who fought for the United States, rather than the Confederacy, and the internal turmoil and dissension caused by anti-Confederate thought and activity. He contends that the Confederacy was defeated as much by internal dissent as by the armies of the United States. A good recent biography that examines Thomas’s loyalty to the United States. Einolf argues that we should examine Thomas in the light of his devotion to the cause of Union and not through the lens of the Lost Cause. Provocative and cutting-edge essays on Virginia during the Civil War, including an unflinching and critical examination by Wayne Wei-siang Hsieh of Lee’s decision to leave the U.S. Army after nearly 30 years to lead the rebel forces. Goldfield’s provocative account of the ongoing meaning of the Civil War in southern society, culture, and politics. 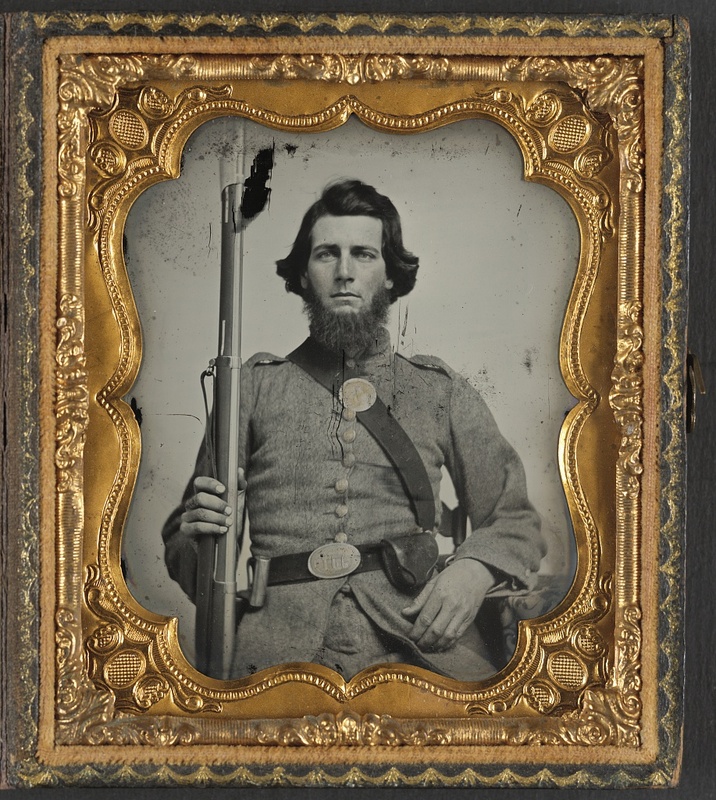 Unidentified private in Confederate uniform and Georgia frame buckle with bayoneted musket. 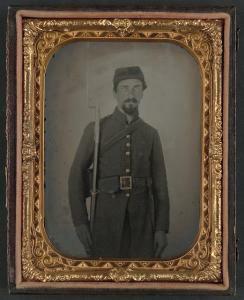 From the Library of Congress Liljenquist Family Collection of Civil War Photographs, AMB/TIN no. 2833 [P&P]. Demonstrates that southern women were far from passive players on the Confederate homefront, and the role they played in resisting what they considered to be illegitimate Confederate authority. Places Grant and the Unionist cause of the War back at the center of the meaning of the conflict. Miller demonstrates that Lincoln understood that the war was fundamentally about the preservation of the republic and that even before emancipation became a war aim, the cause of the United States was a profoundly moral one.